There’s no doubt that cats make for some pretty solid pets. They tend to be fairly easy to take care of, independent enough that you can leave them alone for a while, and they can even provide some entertainment. However, they do require care, and this includes things like cat beds, perches, and other similar things. If you didn’t know, cats love being inside of little houses, on top of perches, in cozy spaces, and they like to look down on the world from above. To accommodate these needs, you could look into something like a hanging cat condo, such as the one we are here to review today. The K&H Pet Products Hangin’ Cat Condo is a very simple yet neat little cat accessory to have. It’s like a little 5-in-1 cat house, one that has a lot of peepholes, is open on the inside for freedom of movement, and it even hangs on any door for convenience. Now, some people may not be particularly thrilled about a cat tree that hangs on a door, but it is intended to be used with a door that does not get opened too frequently. It’s definitely a neat idea to keep in mind if you need a place where your cat can lounge, explore, and keep an eye on things from above. If you have limited space in your home and just need a simple cat tree for your cat to lounge in, the K&H Pet Products Hangin’ Cat Condo could be a good option for you to keep in mind. When you purchase the K&H Pet Products Hangin’ Cat Condo, you get a 5-level hanging cat tree that mounts to any door with relative ease. It does not come with hanging toys or a scratching section, however. First of all, something which many people really like about the K&H Pet Products Hangin’ Cat Condo, is that it is a cat tree, per se, that takes up less space than most others. You see, most cat trees need to be placed somewhere with a decent amount of space, preferably away from a wall or corner. Therefore, a normal cat tree, especially one of a good size, automatically takes up a lot of space. 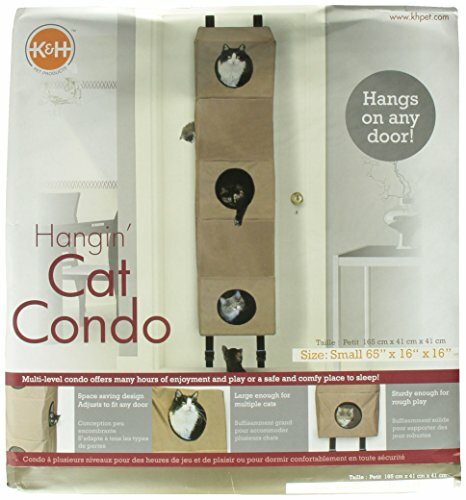 However, the K&H Pet Products Hangin’ Cat Condo hangs on a door, is fairly narrow and shallow, and therefore does not take up much space at all. It simply hangs on a door and therefore is out of the way. As we mentioned, it might not be the best item to get if you only have a couple of doors. Such as in an apartment, as constantly opening and closing any door with the K&H Pet Products Hangin’ Cat Condo hanging on it is not going to be overly enjoyable, either for you or the cat. But what you might also like about this item is that it folds down into a neat little package that is easy to store in a small space when not in use. The K&H Pet Products Hangin’ Cat Condo is fairly easy to mount to any door, and it comes with everything needed, which is more or less the straps and buckles. On a side note, when mounted, the straps are fairly durable, so they should never rip and send your cat careening to the ground, but they can get in the way of properly closing the door. We appreciate how the K&H Pet Products Hangin’ Cat Condo is made out of durable materials. For whatever reason, it is waterproof and very resistant to scratching, although not impossible to destroy. The material it is made of does make it fairly easy to clean. 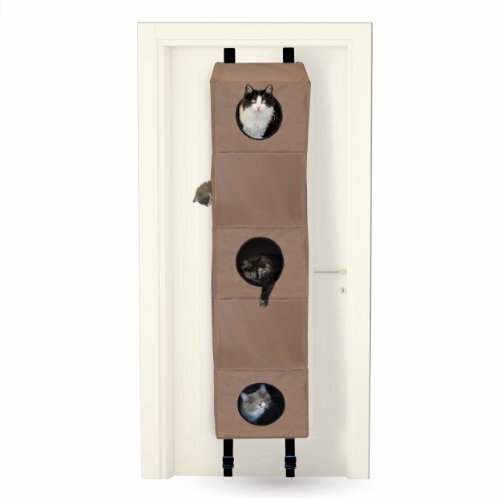 Furthermore, the K&H Pet Products Hangin’ Cat Condo will take up more or less the whole height of a door, and it comes with 5 different layers. These are like little apartments inside of the K&H Pet Products Hangin’ Cat Condo, and there are holes on the interior so your cat can freely move from one section to the next without having to go outside of it. Each of the 5 layers has a peephole so your cat can look out and keep an eye on things from above, with 2 of the sections actually having 2 peepholes each. The K&H Pet Products Hangin’ Cat Condo is very easy to set up. Simply use the included straps, which are attached at the top and bottom. Pass the straps under and over the door, and connect them in the back using the buckles, then close the door. When it comes time to put it away, just disconnect the buckles, fold the whole thing down, and there you go. What we do have to say about the K&H Pet Products Hangin’ Cat Condo is that it can get in the way due to being door mounted, there are no scratching posts or pads, and the interior is not particularly soft either. If you would like something that resembles a normal cat tree and scratcher, you could take a look at FurHaven Pet Cat Furniture. This is a more conventional multi-tiered cat lounger, with lots of platforms, hanging toys, and scratching posts too. It’s not that large, so it should do fine, even in fairly small spaces. The K&H Pet Products Hangin’ Cat Condo is a neat solution to go with. Now, it might not be the best idea if you only have limited doors in your home, all of which get opened a lot, as it can get in the way. However, it’s still a cool thing to have if you have a cat that loves climbing around, lounging, and looking down from above. It is durable and should provide your cat with both some fun and comfort too.